Designed specifically to fit the Beretta CX4 Storm 9mm Carbine ONLY. We test all our Muzzle Brakes & Barrel Shrouds to be 100% sure that they function shot after shot without any problems. In this case the end of the barrel is basically sticking out the front end of the barrel shroud. The user should NEVER slide this item forward to that the slots are open. This will cause the product to be un-stable and dangerous to use. The MFI Beretta CX4 BSG Muzzle Brake / Barrel Shroud slides onto your barrel and we supply 3 set screws located at the rear knurled area that holds the item in place. These set screws are steel tipped and make contact with your barrel. You may use Loctite, Weld or Silver Solder over the set screw to make this more permanent. This Barrel Shroud / Fake Muzzle Brake is specifically made for the Beretta USA CX4 Storm 9mm Carbine. The weapon will fit in the Beretta Hard Case with this attached. The above photos show the MFI Beretta CX4 9mm Storm Battlestar Galactica (BSG) Shroud, which shows the Correct position of the barrel (at the end of the shroud). This product fits ONLY the Beretta USA CX4 Storm Carbine in 9mm. Unlike our other products this item is specifically for a VERY LIMITED MARKET and as such is made in very small volumes. Normal production for any other item is 1000 per year minimum. This Special CX4 version we have only made 50 units to test the market. So it goes without saying we have to charge more money for these. We do our best to keep the price down for our valued CX4 customers. The MFI CX4 Storm Battlestar Galactica Style Muzzle Brake / Barrel Shroud does NOT reduce muzzle noise or muzzle flash in any way. So these are 100% legal for the regular civilian to own in all 50 US States. SPECIAL NOTE ON STYLE & TRADE NAMES: Battlestar Galactica as well as other marks, are Registered Trademarks of NBC Universal and are used on this web site for reference only. This item is NOT manufactured by nor endorsed by NBC Universal. This trademark holder has NO relationship to this product, nor any product offered by MFI. This is NOT an exact copy of the in anyway of the original screen used prop. We made sure that there were enough differences to avoid any conflict or confusion in the market place. Fact is it would be impossible to make an exact copy as the original prop guns used on the show were cut down and thus became Title II BATF / NFA SBRs (short barreled rifles) and thus restricted by Federal Law. This product does NOT reduce muzzle noise or muzzle flash in any way. So these are to the best of our knowledge 100% legal for the regular civilian to own in all 50 US States. The made of 6061 T-6 Aircraft Grade Aluminum. Fits only Beretta CX4 9mm Carbine. Maximum Outer Diameter: = 0.990" / 25mm. Maximum Inner Diameter: = 0.605" / 15.3mm. Maximum Length: = 4.410" / 112.0mm. YES Weapon will fit in the Beretta Hard Case with this attached. Mil. Spec. Black Anodized to give the unit a semi matt finish. 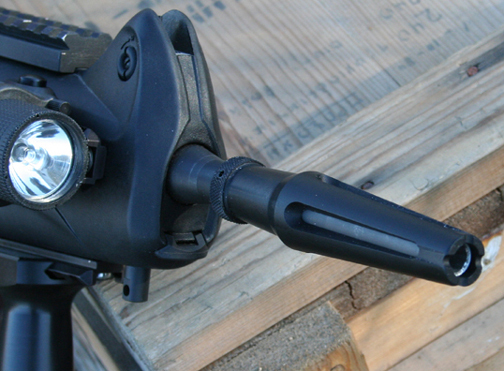 The MFI Beretta CX4 BSG Muzzle Brake / Barrel Shroud does NOT reduce muzzle noise or muzzle flash in any way. So these are 100% legal for the regular civilian to own in all 50 US States. The MFI Beretta CX4 Battle Star Galactica Style Muzzle Brake / Barrel Shroud fits the CX4 Storm Rifles in 9mm ONLY WITHOUT ANY MODIFICATION. Makes my CX4 look soooo cooollll!!! I am so pleased with this product. It makes my CX4 look just like the ones on Battlestar Galactica!! Shipping so unbelivebly FAST as well... 2 days from point of ordering and I am half way across the country from them. I am now a member of the Colonial Marines! First off I am a super fan of the TV show Battlestar Galactica, so detail is really important to me... I know that the original CX4s use on the show were 13.5 cut down barrels and thus SBR (short barreled rifles) which I can not own in my state. This brake really completes my CX4 Strom and my Colonial Marine Uniform! I searched high and low for this product and was suprized to find one so close to the original from the show without making my CX4 a SBR. Super nice finish and amazing high end machining. I am so glad that someone pays attention to the CX4 market and prides themselves on making a quality product at a more than far price! AWESOME addition to my Beretta CX4 Storm!!! I have always enjoying shooting the Beretta CX4 Storm, but didn't like the extended naked barrel. This barrel shroud is perfect! I love the look on the rifle as well as the light material which adds no real weight to the end of the barrel. Great job! After trying to find accessory for bretta cx4 storm this is the best product I have found great quality will buy again I hope y'all come up with some more accessory for the storm!!!!! Great Product: Gun still fits in factory case. Great job MFI! I was looking for a muzzle attachment that would still allow my CX4 Storm carbine to fit in the factory plastic case. A lot of the brakes out there make the gun too long, and you end up having to buy a new case, but with the Battle Star Galactica, the gun still fits in the case and looks really cool as well. Thanks! I wanted something to add some flare to my boring looking stock CX4 barrel. This shroud definitely fits the bill. It is extremely well manufactured and looks great on my CX4. It doesn't add a lot of bulk, like most shrouds on the market. It is a perfect addition, whether you are a fan of BSG or not. I bought a few of these last year for my cx4-storm rifles and they fit and work and look awesome! Just like they looked on Battlestar Galactica!